Whether you’re actually out camping, or you just want the flavor of the great outdoors inside your kitchen, nothing beats a campfire chili. There’s something about the smokey, spicy flavor that really gives you a good kick. It makes you think of the times you’ve spent outdoors, and that’s always worthwhile. And of course, on a cold night out in the woods, it brings a bit of warmth to your belly. Once you have the ingredients, you’re ready to start. Get a pan and brown the meat. You can drain the meat if you want, or add the grease in for flavor if you don’t mind your chili being a bit richer. Water saute the onions, bell peppers, corn, and jalapenos until they begin to soften. Add the ground beef, and use the flour to thicken. If you’re unfamiliar with using flour to thicken, mix some flour into a small amount of cold water, and pour the water into the saute pan. If you want a thicker chili, you might want to use less water. Just remember, it’s not supposed to be soup, so thicker is often better. Once it’s thickened to your taste, add the chili powder and mix thoroughly. 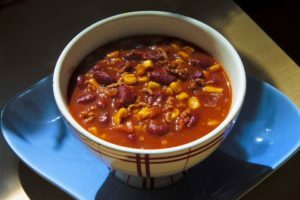 Campfire Chili can be a great way to warm the belly and add a little spice to your night. If you’re not sure about the jalapenos, you can leave them out for a much more mild experience. It’s all about what you enjoy eating!